Today’s Daily Travel & Deal Blog from the Los Angeles Times made reference to a collection of spectacular bookstores that ought to inspire readers to travel. The librarian in me has to call them on the carpet for failing to note that publication’s equally spectacular photo collection of beautiful libraries scattered throughout the world. 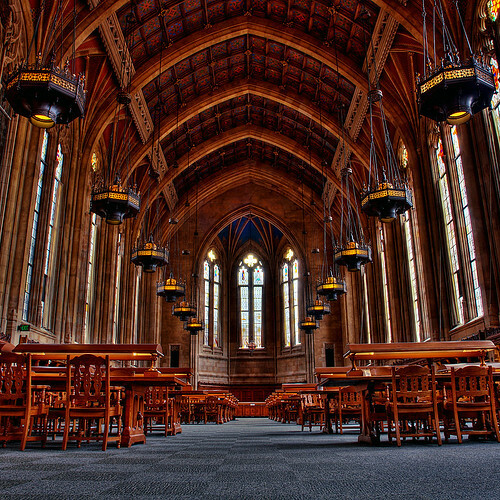 Two U.S. libraries made the list: the Suzallo Library at the University of Washington, for its architecture, and the New York Public Library near Bryant Park (the Humanities and Social Sciences Library), for its artwork. The Reading Room, originally uploaded by Cap’n Surly.